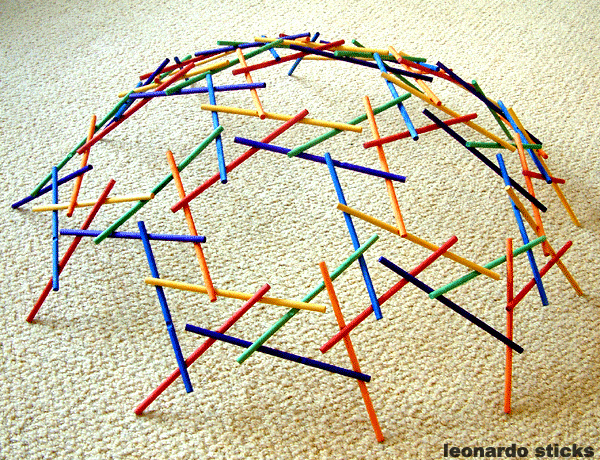 The economy operates within a finite world, so at some point, a problem of diminishing returns develops. In other words, it takes more and more effort (human labor and use of resources) to produce a given quantity of oil or food, or fresh water, or other desirable products. The problem of slowing economic growth is very closely related to the question: How can the limits we are reaching be expected to play out in a finite world? 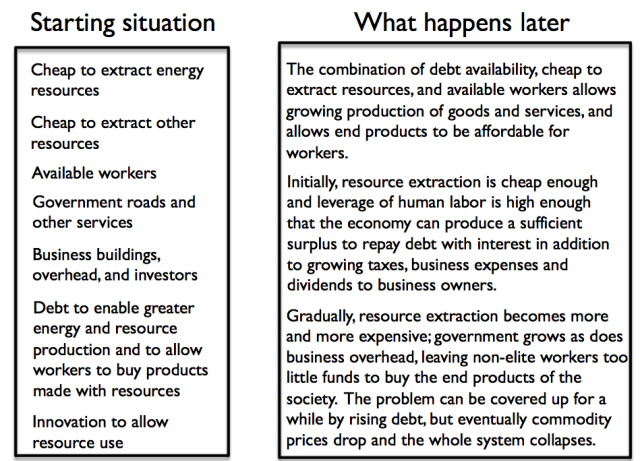 Many people imagine that we will “run out” of some necessary resource, such as oil, but I see the situation differently. Let me explain a few issues that may not be obvious. 1. Our economy is like a pump that works increasingly slowly over time, as diminishing returns and other adverse influences affect its operation. Eventually, it is likely to stop. As long as (a) energy and other resources are cheap, (b) debt is readily available, and (c) “overhead” in the form of payments for government services, business overhead, and interest payments on debt are low, the pump can continue working as normal. As various parts of the pump “gum up,” the economic growth pump slows down. It is likely to eventually stop, once it becomes too difficult to repay debt with interest with the meager level of economic growth achieved. Let me explain some of the pieces of the problem that give rise to the slowing economic growth pump, and the difficulties it encounters as it slows down. 2. “Promises,” such as government pension programs for the elderly, and promises to repair existing roads, tend to get bigger and bigger over time. Suppose a pension program begins in 2010 and gradually adds more retirees. Or suppose a road repair program starts out in 2010 with more roads gradually being added. The payments made each calendar year, whether for the pensions or the road repairs, are the totals at the bottom of the column. These totals keep growing, even if each retiree gets the same amount each year, and even if each road costs the same amount to repair each year. Admittedly, using 100 for all amounts is unrealistic–this is done to keep the math simple–but regardless of what numbers are used, the sum of the payments each calendar year tends to rise. 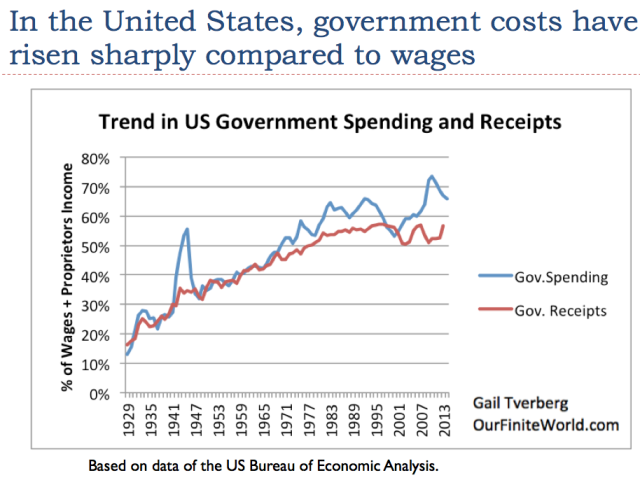 If we look at US government expenditures as a percentage of wages, the pattern is as we might expect: government spending rises significantly faster than wages. 3. At least partly because of growing “promises,” it is very difficult for an economy to shrink in size without collapsing. We can think of many kinds of promises in addition to pensions and road repairs. One such promise is the promise by banks that they will allow depositors to withdraw funds held on deposit in the bank. Another kind of promise is the promise of debtors to repay debt with interest. All of these promises tend to grow in total quantity over time, at least in part because population grows. If an economy shrinks, all of these promises become very difficult to fulfill. This is the problem that Greece and other countries in financial difficulty are encountering. There is a need to reduce some program or to sell something so that the calendar year payments are not too high, relative to revenue for the year. 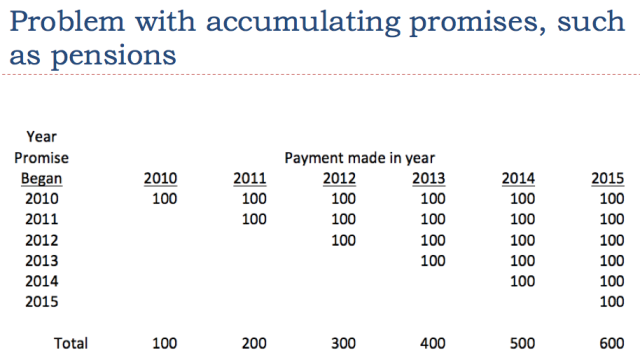 These payments really represent a flow of goods and services to the individuals to whom the promises were made. “Printing money” does not really substitute for goods and services: pensioners expect that they will be able to buy food, medicine and housing with their pensions; those withdrawing money from a bank expect that the money will actually buy goods and services needed to live on. If there is a major problem with “making good” on promises, it is difficult to have an economy. It is hard to operate an economy without functioning bank accounts. Even cutting off pensions or road repairs becomes a problem. 4. The over-arching problem as we reach diminishing returns is that workers become less and less efficient at producing desired end products. 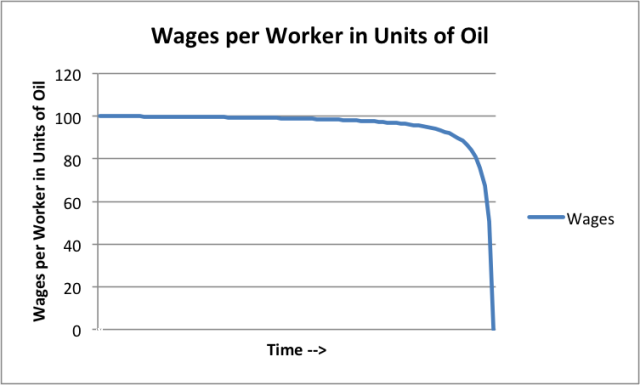 Looked at a different way, the number of barrels of oil produced per worker starts decreasing (refer to the figure mentioned below). It is as if the worker is becoming less efficient. His wages should be reduced, based on his new lack of productivity. There are many types of diminishing returns. They tend to lead to a smaller quantity of end product per worker. For example, if the population of a country increases, but arable land stays the same, adding more and more farmers to a plot of arable land eventually leads to less food produced on average per farmer. (Some might say that each additional farmer adds less marginal production.) Similarly, mining ores of lower and lower concentration leads to a need to separate more and more waste material from the desired mineral, leading to less mineral production per worker. As another example, if a community finds itself short of fresh water, it may need to begin using desalination to produce water, instead of simply using relatively inexpensive wells. The result is a steep rise in the cost of water produced, not too different from the steep rise in the cost of oil in Figure 6. Viewed in terms of the amount of fresh water produced by each worker, the return per worker falls, as happens in Figure 7. If workers get paid for their work, the logical result of diminishing returns is that after a point, workers should get paid less, because what they are producing as an end product is diminishing in quantity. Workers may be making more intermediate products (such as desalination plants or fracking sand), but these are not the end products people want (such as fresh water, electricity, or oil). In some sense, fighting pollution leads to another form of diminishing returns with respect to human labor. In this case, increasing human effort and other resources are used to produce pollution control equipment and to produce workarounds, such as alternative higher-priced fuels. Again, wages per worker are expected to decline. This happens because, on average, each worker produces less of the desired end product, such as electricity. Admittedly, less pollution, such as less smog, is desired as well. However, if it is necessary to pay extra for this service, the effect is recessionary because workers must cut back on purchasing discretionary goods and services in order to have sufficient funds available to purchase the higher-priced electricity. Thus, fighting pollution using approaches that raise the price of end products is part of what slows the world’s economic growth pump. 5. When civilizations collapsed in the past, a major cause was diminishing returns leading to declining wages for non-elite workers. We know how diminishing returns played out in a number of past civilizations based on the analysis conducted by Peter Turchin and Surgey Nefedov for their book Secular Cycles. They found that typically a period of rapid population growth took place after some change occurred that increased the total amount of food an economy could provide. Perhaps trees were cut down on a large plot of land, or irrigation was introduced, or a war led to the availability of land previously farmed by others. When the original small population encountered the newly available arable land, rapid growth became possible for a while–very often, for well over 100 years. At some point, the carrying capacity of the land was reached. Then the familiar problem of diminishing returns on human labor occurred: adding more farmers to the plot of land didn’t increase food production proportionately. Instead, the arable land needed to be subdivided into smaller plots to accommodate more farmers. Or the new farmers could only be “assistants,” without ownership of land, and received much lower wages, or went to work for the church, again at low wages. The net result was that at least part of the workers started receiving much lower wages. One contributing factor to collapses was the fact that required tax levels tended to grow over time. Some reasons for this growth in tax levels are described in Items (2) and (3) above. Furthermore, the pressure of growing population meant that groups needed access to more arable land–a problem that might be overcome by a larger army. Paying for such an army would require higher taxes. Joseph Tainter in The Collapse of Complex Societies writes about the problem of “growing complexity,” with rising population. This, too, might give rise to the need for more government services. Raising taxes became a problem when wages for much of the population were stagnating or falling because of diminishing returns. If taxes were raised too much, low-paid workers found themselves unable to buy enough food. In their weakened condition, they tended to succumb to epidemics. If taxes couldn’t be raised enough, governments had different problems, such as not being able to support a large enough army to fend off attacks by neighboring armies. 6. The United States now has a problem with declining wages of non-elite workers, not too different from the problem experienced by civilizations that collapsed in the past. 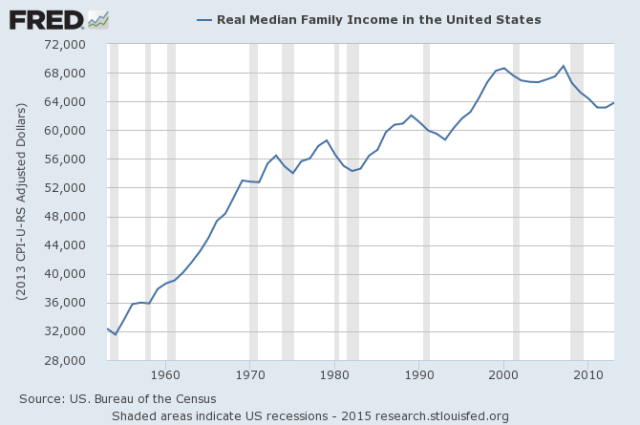 Below mentioned figure, shows that on an inflation-adjusted basis, US Median Family Income has been falling in recent years. In fact, the latest value is between the 1996 and 1997 value. In a sense, this represents diminishing returns on human labor, just as has occurred with agricultural civilizations that collapsed. Wages have been falling to a much greater extent among young people in the United States. 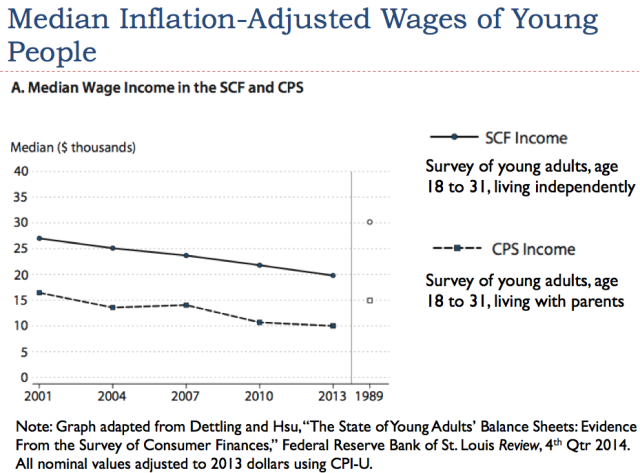 Refer to below chart, from a report by Dettling and Hsu in the Federal Reserve Bank of St. Louis Review shows that median wages have dropped dramatically since 1989, both for young people living with parents and for young people living independently. To make matters worse, the report also indicates that the share of young people living with parents has risen during the same period. In some sense, the loss of efficiency of the economy (or diminishing returns) outlined in Item 4 is making its way through to wages. The wages of young people are especially affected. 7. 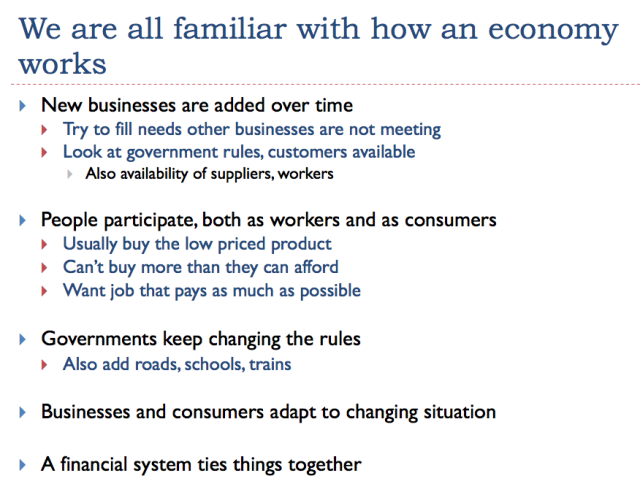 Demand for goods and services comes from what workers can afford. If their wages are low, demand for goods of many kinds, including commodities, is likely to fall. There are many rich people in the world, but most of their wealth sits around in bank accounts, or in ownership of shares of stock, or in ownership of land, or in other kinds of investments. They use only a small share of their wealth to buy food, cars, and homes. Their wealth has relatively little impact on commodity prices. In contrast, the many non-elite workers in the world tend to spend a much larger share of their incomes on food, homes, and cars. When non-elite workers cut back on major purchases, it is likely to affect total purchases of goods like homes and cars. Other related goods, such as gasoline, home heating fuel, and the building of new roads, are likely to be affected as well. When the demand for finished goods falls, the demand for the commodities to produce these finished goods falls. Because of these issues, when the wages of non-elite workers fall, we should expect downward pressure on commodity prices. Commodity prices may fall back to a more affordable range, after they have spent several years at higher levels, as has happened recently. There is a common belief that as we approach limits, the price of oil and other commodities will spike. I doubt that this can happen for any extended period. Instead, the low wages of non-elite workers will tend to hold commodity prices down. Because of this issue, we should expect predominately low oil prices ahead, despite the continuing pressure of rising costs of production because of diminishing returns. The mismatch between the rising cost of commodity production and continued low commodity prices is likely to lead to a sharp drop in the supply of many types of commodities. Thus, the slowing operation of our economic growth “pump” is likely to lead to a situation where the production of commodities, including oil, falls because of low prices, not high prices. 8. What is needed to raise the productivity of workers is a rising quantity of energy to leverage human labor. Such energy supplies are affordable only if the price of energy products is very low. The amount a person can produce reflects a combination of his own labor and the resource he has to work with. If energy products are available, they act like energy slaves. With their assistance, humans can do things that they could not do otherwise–move goods long distances, quickly; operate machines (including computers) that can help a worker do tasks better and more quickly; and communicate long distance by means of the telephone or Internet. While technology plays a major role in making energy products useful, the ultimate benefit comes from the energy products themselves. We have been using a rising amount of energy products since our hunter-gatherer days (Refer to the chart mentioned below). 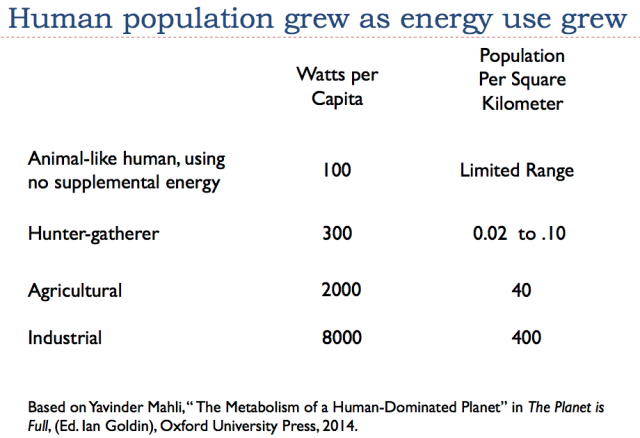 In fact, the use of energy products seems to distinguish humans from other animals. Clearly, cheaper is better when it comes to the affordability of energy products since available money goes further. If gasoline costs $5 per gallon, a worker with $100 can buy 20 gallons. If gasoline costs $2 per gallon, a worker with $100 can buy 50 gallons. In recent years, with the high prices of energy products, world growth in energy consumption has lagged. It should not be surprising that world economic growth seems to be lagging during the same period. 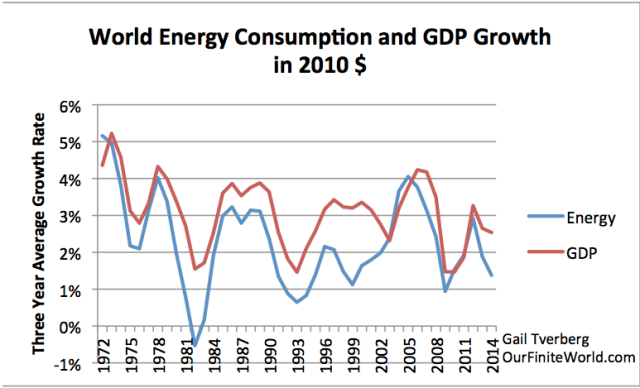 Three year average growth rate in world energy consumption and in GDP. World energy consumption based on BP Review of World Energy, 2015 data; real GDP from USDA in 2010$. In fact, in above chart, it seems to indicate that changes in energy consumption precede changes in world economic growth, strongly suggesting that growth in energy consumption is instrumental in raising economic growth. The recent steep drop in energy consumption suggests that the world is approaching another major recession, but this has not yet been recognized in international data. 9. One way of describing our current problem is by saying that the economy cannot live with the high commodity prices we have been experiencing in recent years and is resetting to a lower level that is affordable. This reset is related to low net energy production. 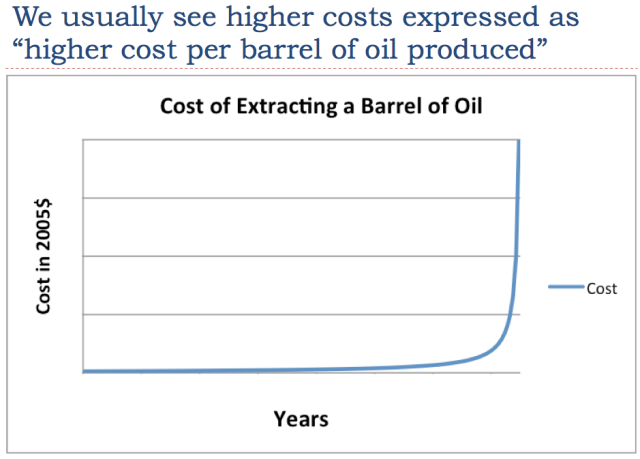 If oil and other commodities could be produced more cheaply, they would be more affordable. We would not have the economic problems we have today. Energy use in Figure 11 could be rising more quickly, and that would help GDP grow faster. If GDP were growing faster, we would have more funds available for many purposes, including funding government programs, repaying debt with interest, and paying the wages of non-elite workers. We perhaps would not have the problem of falling wages of non-elite workers. The current “fad” for solving our energy problem is to mandate the use of intermittent renewables, such as wind and solar PV. A major problem with this approach is that such renewables make the cost of electricity production rise even faster, exacerbating our problems, instead of making them better. The way our economy works, energy flows in a given year (not on a net present value basis) are what are important, because this is the way we use energy to make goods such as foods, metals, and homes. The energy flows of renewables are very much front ended. Thus, the disparity in energy use on an energy flow basis is likely to be greater than reflected in Figure 12. What we really need from energy products is the ability to stimulate the economy in a way that adds tax revenue. Either the energy products must produce high tax revenue directly, or they must indirectly produce high tax revenue by stimulating demand for new cheaper goods, produced with the new inexpensive form of energy. This is what I think of as “adding net energy”. 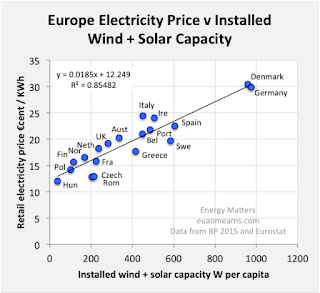 Wind and solar PV clearly do the opposite. Thus, they behave like “energy sinks,” rather than as products that add net energy. Modern renewables that are connected to the grid can be expected to stop working when the grid stops working. This may not be too far in the future because we need oil to operate the trucks and helicopters that maintain the electric grid. 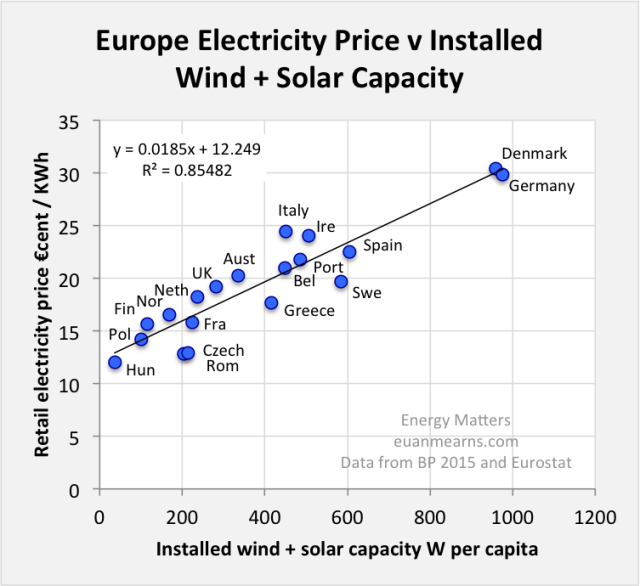 If this problem were considered in the pricing of electricity from wind and solar PV, their required prices would be higher. As I see it, one of the major roles of energy products is to support the growing overhead of our economy; this is what the discussion about the need for “net energy” is about. Thus, we need energy products that are cheap enough that they can be taxed heavily now, and still produce an adequate profit for those producing the energy products. If we find ourselves mostly with energy products that are producing cash flow losses for their producers, as seems to be the case today, this is an indication that we have a problem. We don’t have enough “net energy” to run our current economy. 10. Debt and other paper assets are likely to “have a problem” as the economic growth pump falters and stops. Debt is absolutely essential to making an economy work because it allows businesses to “bring forward” future profits, so that they don’t have to accumulate a high level of savings prior to building a new factory or opening a new mine. Debt also allows potential buyers of expensive products such as homes, cars, and factories to pay for them on an affordable monthly payment plan. Because more buyers can afford finished goods with the use of debt, debt raises the demand for goods, and indirectly raises the prices of commodities. With these higher prices, a greater quantity of commodity extraction is encouraged. At some point, it becomes very difficult to support the very large amount of debt outstanding. In part, this happens because of the large accumulated amount of debt. Falling inflation-adjusted wages of rank and file workers add to the problem. In such a situation, interest rates need to be kept very low, or it becomes impossible to repay debt with interest. Even with continued low rates, defaults can eventually be expected. Once debt defaults begin, commodity prices are likely to drop even further. Such a drop is likely to lead to even more loan defaults, especially by commodity producers (such as oil companies) and commodity exporters. Prices of equities can be expected to drop as well, because the problems of the debt system will affect businesses of all kinds. Once debtors start defaulting, it will become very difficult to keep financial institutions from collapsing. International trade is likely to become a problem because financial institutions are needed to provide debt-based financial guarantees for long-distance transactions.